Soooooo result was 4th place and invite to finals. I’m very pleased with this as bodyfat could not of been Lower n I was dry as a bone as pics show. 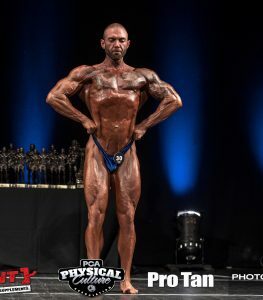 Gaz came second and was twice as conditioned as winner just not big enough invite to finals. Bens first ever showing and he looked unreal. Didn’t place but was potentially in best condition in class n his transformation this prep as can be seen is unreal. I wouldn’t believe it myself if I hadn’t been the one controlling it. 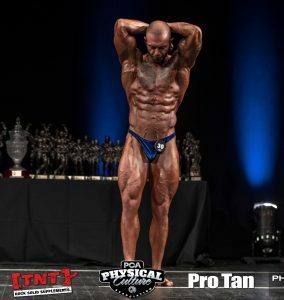 Feedback for myself I look more like a MR than classic for PCA criteria and was beaten by guys just smaller with smaller structures. I was so focused on keeping weight down n being dry for classic I only loaded one day then dried out the Friday. I then looked soft through the glutes n Hams. This was caused by lack of glycogen n pressure in the muscle. So next time 2 day load then dry. 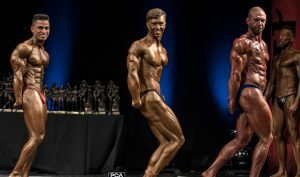 Going forward – my intention was to do the 2bro show in October and there classic criteria seems to approve bigger more muscular classic look so I will prep for this with room to fill out and be bigger. I will also do pca finals which I think is after this and may blow up n try n expand as much as possible n do the MR class just for experimentation n fun. First time ever I am not training for 2 weeks or going to try my best not to. Just cardio n chill. I have a photo shoot today , wedding Saturday and then Spain for ten days were I will be fully focused on enjoying myself with my GF. On holiday now so after I get back I will of done 3 weeks chill – hcg , clomid and OTC PCT tabs fromprohormones.eu that I used before n are making me horny as lol.